We attended a Hannukah reception, a first for me, last night. I shook hands with many people and smiled until my jaws ached. The rabbi sang and lit the five candles for this fifth day, and later there was more singing by the local Jewish community. This is possibly the only function I have attended this year where the menu highlights two types of donuts and two types of potato latkes; making it mandatory to sport an icing sugar moustache. I think there was a mini-meme that went round the food blogoshere a few months ago featuring bloggers and their refridgerators, but I couldn't find it just now. Not an entirely new idea because ST runs a similar column every Wednesday in their health supplement section, featuring local personalities and their fridges. I have 2 at home, which I love a lot. Neither are in the 'rich-guy' category as defined by our blog princess, definitely the 'poor' type with two doors and cheap magnets on its face. 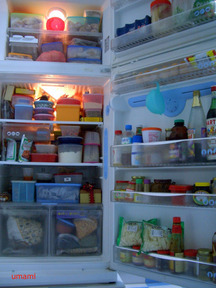 The insides carry many good things to eat. Plus, mine look rather like Tupperware advertisements; husband and I cannot abide fridge odours and food containers do help. The big fridge is for storing essential supplies like meat, eggs, fish, vegetables and sauces while, the other smaller model sits a step across the kitchen and is used for jams, fruits, ice cream, bread, teas and wines. Some time back in July, we were sitting around a table eating dinner with friends when invitations were casually given for a home-cooked gourmet dinner prepared by highly passionate casual-turning-professional-cook Casey . 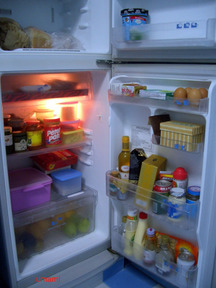 That's the dedicated eater's life, planning meals in advance while present one is not yet eaten. But, the weeks and months came and went but the invitation did not evolve into anything concrete, so much so that we thought the event has been called off, or worse, happened without us. Then, in late November, unexpectedly, Casey announced that he was ready, and he would cook, and our friends the ever-generous Mr and Mrs L graciously offered up their home to host the a-promised fine meal. Over the weeks, the anticipation built up as Casey revealed the menu and we prepared ourselves for a fine multi -course meal that would take him three days to cook up. On the day itself, we tried to get to the host's place early in case Casey needed help but were surprised to find a quiet and very clean kitchen. There was only a duck warming in the oven. For a moment I thought I got the dates wrong. No, Mrs L assured me, Casey has prepared everything in advance and dinner only needed to be heated through. Mr L poured chilled wine for everybody and we sat down to eat. Singapore Stir-fried mystery noodle : The surprise was there wasn't really any noodle in this dish, although the texture of shark's fin can approximate noodle somewhat. Actually it was an updated version of the retro wedding dinner starter dish of egg-fuyong (shark's fin omelet), only this time it was jazzed up with julienned vegetables and tossed with a fresh citrusy dressing. 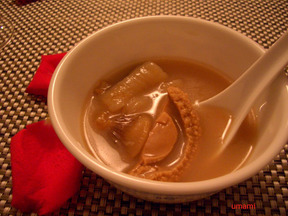 Buddha Jump over the wall: Very luxe with abalone, sea cucumbers and Chinese mushrooms. Casey informed us that the soup was blended from three types of stock- duck, chicken and seafood, making it richly layered with umamilicious flavours while maintaining a fairly clear colour. It was served slightly cool, but this oversight paradoxically enhanced the taste in a very good way, for me at least. Crayfish Angel Hair : just a pretty twirl of pasta tossed with pesto, accompanied by a chunk of tender lobster. Tequila Oyster: Fresh oyster in tequila batter with seaweed and tobiko. Briny and appetising. Mystery Crab: First, we didn't know it was crabs because what was borne to the table was covered with a big piece of lotus leaf. The second surprise was that the crab was hairy crabs. Which was difficult to procure so late in its season. Casey said he got lucky, there were some at Chinatown market where he shopped for the ingredients. The crabs were marvelous, scented ever-so-delicately with the lotus leaf which it was wrapped in after being steamed. Dong Bo Rou: It was his first attempt, and he has never tried the China versions before. Not quite the rich, unctuous porky treat that the mainlanders are known for, it was nonetheless a very tender and juicy pork rich with the flavours of spiced dark soya sauce. Imperial Herbal turtle: Made into a full-bodied soup that reputedly puts hairs on one's chest and is magnificient for boosting libido. Not actually a turtle, more like a big terrapin. The surprise was the eggs, which at a hawker centre one would have to pay extra for as they are harder to come by, but like Casey nonchalantly told us, he was quite lucky at the market that day. 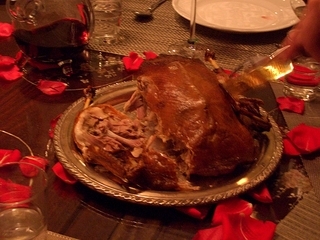 Thrice-cooked duck: The classic stuffed duck cooked Chinese style, i.e. bathed first in hot oil, steamed for 3 hours and then roasted. His version was fab, says I who hogged the plate; well-executed, with crisp skin and lean, tender meat stuffed with an aromatic mix of chestnuts and yams. Prawn dumplings : Deep fried dumplings for a little break. His reluctance to inconvenience our host and mess up their kitchen meant this little snack was not as crispy as it should, but the sweet juicy fillings more than compensated for the soggy exterior. Poached grouper cheek: He managed, lucky him (and us), to also purchase another rare find, i.e. a grouper head wider than my shoulders. Only the very tender, delicate and sweet cheek was poached in a delicate sauce. The rest of the head ? I think he saved up for curry, maybe. Yang Zhou fried rice: In case anyone was still hungry. The lavish meal ended with two equally indulgent desserts by Jeremy- rich chocolate cake and my favourite lemon cheesecake. This is what lunch looked like the day after Christmas. Because it was all our stomachs wanted after the excesses of the days before. 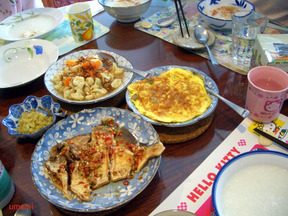 Soft congee with a bit of fish, omelet, vegetables and pickled vegetables. For the curious, table settings are, from top left clockwise, MIL's, husband's and mine. My mum gave me the Hello Kitty place mat in July this year. Actually I am more of a Kiki Lala fan, so if anybody knows of a Little Twin Stars place mat, please let me know. Anyways, for Christmas, we celebrated it at a potluck dinner at a friend's home where we dined unfettered on roast duck, roast turkey with stuffing and cranberry jelly, potato salad, chinese-style cucumber salad, sushi, bread, crackers, three types of cheeses, banana crumble with butterscotch sauce and a pecan pie. Lubrication was in the form of a bottle of sauvignon blanc, 2 of shiraz and 2 sticky wines plus a little more of Baileys, Coke and teas. But it still does not compare to what we ate through last Christmas. 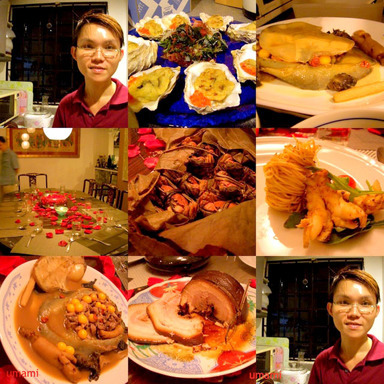 Our Christmas Eve dinner was kept simple and stress-free so husband, myself, MIL, SIL and the domestics could enjoy a meal without messing up the kitchen, leaving plenty of time to enjoy the food and each other's company. Rice with steamed pomfret and apple-cabbage-carrot salad in orange juice dressing, supplemented with cereal prawns and butter crabs from Mellben. Washed down with what husband calls the 'perfect wine'- 1997 Chambolle Musigny Premier Cru, Barthod, and for the non-alcoholics, there was lime-barley drinks and tea. The highlight of the dessert course was a fruit cake baked by my excellent home-baker friend M. I have eaten her magnificient fruit cake in past years and this year I shamelessly asked her if I could have one. Thankfully she said Yes. The cake was perfectly ripe for eating after weeks of feeding with copious quantities of brandy and orange liquers, which mellowed into the moist cake studded with loads of plump raisins, cherries, crystallised ginger and sweet nuts. There was plenty of time to make it for midnight mass, and we celebrated once again the birth of baby Jesus. 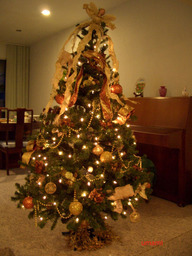 Managed to take a picture of the tree. It is 7 years old and starting to tilt sideways. The angel looks like it wants to fly away. Help!! I succumbed to the promised pleasures of a cempedak log cake. From Amara Hotel. 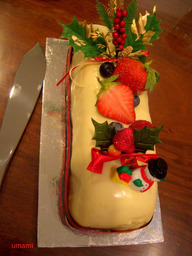 Surprisingly light for a log cake, the inside is sandwiched with generous chunks of the sweet and pungent fruit. I let Rufus lick whatever was left on the tray, quite illicit I know, but I am sure he didn't mind. Have yourselves a Very Merry Christmas and a Blessed New Year ahead. Cheers! squeezeweasel tagged me for this meme, and I have been unfashionably late in finishing it, but here is my top ten favourite foods. For the moment anyway, who knows what else I will take a fancy to tomorrow. 1. Crabs: Hairy crabs certainly ranks high, but I love any big, sweet-fleshed types from Sri Lanka, Alaska, Scotland, Hokkaido and New Zealand. White pepper. BBQ. Steamed with Huatiao wine and chicken fat. More esoteric variations like Marmite, Salted Egg Yolk. 2. Duck. My family is crazy for ducks. Now husband is infected too. At reunion dinners our cousins would go crazy for the big prawns, Chinese mushrooms, smoked meats and other luxury foods, but we would be like the crazy ones, sucking on bones from the duck rib cage, mowing down the platter of roast duck or when my Big Aunt was in the mood, her sour plum braised duck. 3. Popiah: The new favourite is from Malacca. I also have a soft spot for the ones from the pasar malam in Bangsar. And of course, any home-made versions, which are usually packed with much home-cooked goodies, but also much appreciated because the making of all the components is very time-consuming. 4. Tropical fruits: Sweet, juicy pineapple from Thailand. From Malaysia, stinky durians, bananas especially the small finger-long types, pale-fleshed nangka, pungent cempedak, ciku, duku-langsat. Oh, and mangoes from Pakistan. 5. Bread: Crusty European type breads, sweet BreadTalk variants too. The only breads that I don't like is anything with rye, sourdough or cinammon in it. Like rice, good bread can be eaten on its own and is the perfect comfort food- the eating is satisfying and the tearing helps to diffuse angry energies. 6. Chestnuts: I love chestnut like I love mangoes, and cannot resist buying whenever I see any. 7. White cherries: Rare and expensive in these parts. Some years the season is so fleeting I never get to taste any. 8. Fish eggs/ roe: Tobiko, Ebiko, Mentaiko, Caviar, of course. Well, OK, ebiko is technically shrimp eggs.... Top on this little list is the luscious jewel-like uncured salmon eggs eaten au naturel with only a dash of yuzu juice. Pop-pop-pop, so heavenly. 9. Goose liver sausage: Has to be from Hong Kong, preferably Yung Kee. 10. Rice. Once, when I was studying in London, we were taken out for dinner by my mum's cousin. This uncle was quite particular, and would only eat at restaurants that served good rice. Didn't matter how lauded the cooking was, if their rice was not good enough, he wasn't interested. A few months ago I learnt of his premature passing and I regretted that we used to make fun of his fastidious ways. He didn't know it then, but that day he taught me an unexpected lesson. Before, I used to think that rice is rice, a starch to accompany the dishes, only good as a supporting character. That night, I observed the rice- shiny, nutty-sweet and evocatively scented Thai jasmine rice, it was so good it didn't need anything, really, to accompany it. Even as recent as 10 years ago, my mum would request that I bring Thai rice whenever I went home, in those days only local rice would be available in Malaysia as the government wanted to promote local produce. Nowadays of course, we can buy any type of rice we desire, and in the pantry we have Japanese short grain, basmati and carnaroli in addition to the usual staples of jasmine and glutinous varieties. And since we are talking about rice, I would like to add one more of its derivate: Beehoon: Maybe it is a Cantonese or KL/ Malaysian thing, but we do prefer rice noodles over wheat noodles. At the noodle stalls I would usually order beehoon or combine it with kway-teow, its broader cousin. In Singapore the Malaysians give themselves away when they order beef noodles or laksa with fine beehoon instead of yellow mee. My favourite is to have it simply stir-fried with loads of vegetables and sprinkled with fried shallots. There, I am finally done. The meme will end here, if anyone is interested to be tagged please send me an email. There was something about November and Mercury being in retrograde that made it a month of very dull eating. New places failed to excite and old favourites disappointed. 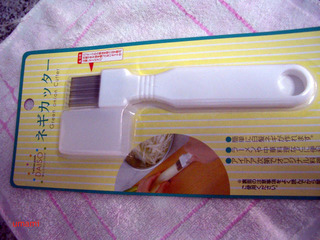 Kaisan (1/9). The food was good, but it takes a blind, deaf and dumb person not to realise that this place is not doing well. There were out of uni by a Friday evening. Johnson was on an indefinite 'sabattical' leave. The sushi counter was manned by Chef Eric whom we felt lacked a certain delicate touch with planning and presentation. Chef Thomas was in the small cooking area where Johnson used to be, and although he made efforts to socialise, he also seemed rather disheartened. Sapporo Noodles, Miharu. While the professionals with long credentials and hard-earned experience struggle with their fine-dining venture, this tiny noodle place tacked to one corner of The Gallery Hotel was doing roaring business. It has acquired a cult-like following, and having failed to get in previously, I was curious to see what the fuss was about. We came early, put our names on the book and waited. Proceeded to order their two most popular selection- a cold noodle with house special soup and a hot Tokusen soup noodle. Both did not live up to our expectations. The noodles very springy but my house special soup was covered with an unappetising layer of oil while husband complained that his soup was too robust and devoid of any subtleties. The side order of char-siew was equally disappointing but this time my complaint was its dryness and toughness- don't think Japanese char-siew is meant to work the jaws too much. Service was mechanical and charmless. Sitting at the counter and being so close to the heat of the stoves was a bad idea too. I observed heavy handed use of Korean miso paste. The bill, an exorbitant 40 plus dollars for 2 noodles, char siew and iced tea. The only good thing to came out of that lunch was my purchase of some scrummy bread from nearby Simply Bread . Auntie Kim's. (2/3) The bbq beef ribs were not as nice as CJ, this place cuts it too thick. Kimchi tofu soup was good. Bibimbap was boring, for a non-meat bap I expected a more interesting mix of vegetables or seeds. We should just stick to japjae next time. Sun with Moon Japanese Dining & Cafe, CHIJMES. This restaurant is part of the Suntory stable, and in keeping with the brand image, the space was beautiful and stylish. Too bad the owners did not invest the same care with their food. Sashimi of binchon maguro? What provenance was this? Neither the waitress nor the counter staff could elucidate. The fish, when it came, was pale and unexciting. A selection of sashimi did not meet our expectations, i.e. fresh and tasty- the ark shell was certainly out of its shell for some time it had started to smell a little fishy. The shimaji and fantail clams sashimi was fine but nothing that says wow to us. Sushi, new age style with avocados or mangoes were more pleasing. The house specialty of kamemashi is like a refined version of our local claypot rice and we enjoyed the version that we ordered, with edamame, chestnuts and crab leg. For dessert, the dango was too hard and they were very mean with the soy powder that accompanied the mochi. Overall, this is a pleasing place to go to for new-style japanese dishes as long as it does not involve top-grade sashimi. Romantic Kobe, United Square. Nothing romantic about plastic chairs, strip lighting and garden tables. Fast-food tonkatsu joint. Rosu Katsu rice with curry was adequate, the pork fillet nicely breaded but the meat itself a little too dry. Husband complained that the beef in his beef curry was absolutely tasteless. Penang Kitchen, Coronation Arcade. From time to time, we cut out newspaper clippings of restaurant reviews and put it into a mental checklist for trying out and this was one of them. The Char Kway Teow was excellent, a little oily but plenty of wok hei discernible within the tasty noodles. Everything else that we ordered failed. The signature Lor Bak was mainly fatty pork pieces parts smothered to death in 5-spice powder. Sago Gula Melaka came with lumpy foamy coconut milk, an absolute no-no for me. Pontini (1/4). Our fourth visit this year, and a rather disappointing meal it was. I waited 30 minutes for a salad of grilled frozen prawns and tough squid. The truffle dishes were exorbitantly expensive ($75 for just the truffle alone, per person) but uninspired. The kitchen seemed to be operating on snooze mode that evening. Chestnut charlotte with whisky sauce had no perceptible taste of chestnuts or whisky. When I quizzed the waiter, he sheepishly mumbled something about "only a little" put in, so that it is OK for kids to eat. The same principle applied too, he gave as an example, to tiramisu. Well, that seemed like complete BS to me, considering they charge adult prices for them. I am writing this place off. Lau Hock Guan Kee Bah Kut Teh, 328, Joo Chiat Rd. One Sunday afternoon we were in the Joo Chiat area and I had a fancy for the gorgeous baby squids from My Mum's Place. But the place was apparently sold out of it, even at the early hour of 5.30 pm. Consoled myself with a fish-head curry meal next door. Their BKT is so-so, but their fish head curry is cooked with plenty of assam to make a thick and spicy gravy and the fish was lightly cooked to let its fresh sweetness come through. Manna Korean Restaurant, somewhere near Telok Ayer. Was in the neighbourhood and popped in on impulse. The ban-chan selection was wider (seaweed not included, that was my extra order) and the Dolsot bimbimbap very satisfying. Ichiban (1/7): Good old standby for lunch. I usually order their cooked dishes or pull one or two sushi plates like unagi or soft-shell crab. Blood Cafe (1/5): My chicken sandwich was too large and dry, so I gave that up in favour of a tart filled with peanut buttery goodness. It was also very large but so decadent and yummy I could not resist finishing it. Shang Palace, Shangri-La Hotel. Farewell lunch for a colleague. This grand restaurant has seen better days. The first thing I observed was the person who guarded the entrance. In most fine dining restaurants, this person would be very pleasant, very attentive and capable of handling many awkward situation. The person on duty that day did not give the expected impression, she gestured extravagantly and her speech was coarse and graceless. It happened also that on that day, there was a large contingent of Japanese tourist accompanied by their self-conscious and very loud tour guide. Her well-meaning instructions shattered the calm of the place and I was surprised that the management did not have the foresight to place the group in another area to allow other diners more privacy. To make things worse, the food was not up to standard and we were compelled to complain to the captain at the end of the meal. Every dish was executed badly. We had ordered the usual items, nothing too challenging for a restaurant of their supposed calibre. Peking duck was dry and the pancake wrapper even drier. Soon hock was over-steamed. Crispy noodles were soggy and the fish slices tough and fishy. Steamed Dong-Po Rou was a misnomer, the belly pork had in fact had all the juiciness and fats cooked out of its every pore. Desserts were in general overly sweet, and steamed egg with ginger juice turned out hard instead of custardy. Oh dear. Penang Place (1/8): I took same colleague here for her farewell lunch. No surprises here. Consistently good. Or is it because it is the only restaurant within the IBP campus? That's about it, a month of very dull eating. I am yawning just typing this out. On our last trip back from KL, I was in half a mind to stop over in Malacca for satay celup. Good sense over-ruled that, after all we were still full from lunch. But the good sense didn't last long, and I was again gripped by the thought of the missed opportunity, so one evening, we decided that, come the weekend, we will drive up for some celup. Three hours drive each way. Surprisingly too, when I put out the call on the makansutra forum, we managed to rope in another crazy makan fella. So it came to be that the four of us, i.e. me, husband, tiantianchi (ttc) and his wife, went to Malacca for dinner. We arrived at about 3.30 pm. The historic town was quite silent, most day-trippers have left and the shops were enjoying the lull before the evening crowds. 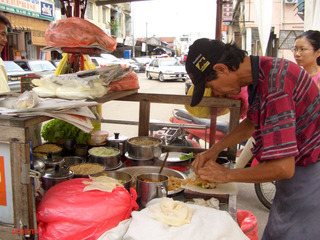 First stop, the famous popiah stall in front of Madam King's Mall on Jalan Bunga Raya. Which happened to be closed. Never mind. Ever-resourceful, ttc asked the nearby shopkeepers who gladly recommended another stall that was just as good but not as well-known. Because his popiah comes with less pork lard but more vegetables. 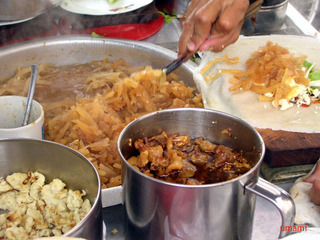 For the uninitiated, pork lard is a crucial ingredient in Malacca popiah. We backtracked a bit to the road in front of the Mimosa Hotel and came across a small crowd gathered around this man's stall. ttc: Uncle, how many pieces do you sell every day? PPM: Over 100 a day. ttc: Are you open every day? PPM: Yes, except Tuesday. We start at 3.30 pm and move over to the front of the Metro store at 5.30 pm. PPM: Do you want pork lard with your popiah? All: (resoundingly) Yes please! .... Unbelievable as it may seem, some people actually order theirs without. Umami: Uncle, do you make the skin yourself? PPM: My wife makes it in the mornings. ttc: Uncle, what is in that mug sitting over the radish? PPM: Garlic oil. When we fry the lard, we use the rendered oil to fry up some minced garlic. It gives extra fragrance. So there you have it, my abolutest favouritest street food. The popiah skin was gratifyingly springy to bite, yielding to reveal the wondrous alchemy of turnips, bean sprouts, chopped omelet, lettuce dressed with sweet bean sauce, chilli paste and generous drizzlings of garlic oil and that beautifully crisped lard. Basic down-to-earth goodness. The memory of it is still fresh in my mind, so very good, so very satisfying. So very cheap, only RM1.50 per piece. It kills me that it is good only in Malacca. ttc have eaten a very bleah fascimile of it in Johore Bahru. Looking around, the other eating seems to be quite good around this neighbourhood too. Since the celup place is not opened yet, we decided to have a cup of coffee at one of the coffeeshops. Accompanied by some very decent siew yoke and ban meen. 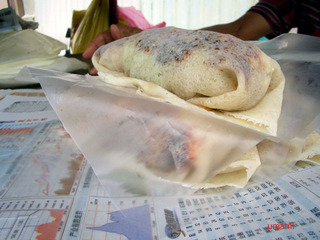 By the time we thought to try some of the yummy-looking fried lor-bak at the top of the junction, it was sold out. Never mind, the celup stall should be opened so we returned to the car. Ban Lee Hiang Satay Celup along Jalan Ong Kim Wee is where we went to for my celup fix. My friend who lives in Malacca told me this is where the locals prefer to eat at, leaving the more famous Capitol Satay to out-of-towners. No arguments here, the last time I ate here I liked it so much I had it again the following evening. Satay celup is, like the popiah, only good in Malacca. The idea is again, rather simple. Sticks of foods are dipped into a rich, spicy satay gravy-like sauce. Unlike conventional steamboats, here in Malacca the eating is more communal. As in the pot is not changed every time new customes sit at the table. A fine practice if double-dipping goes out of fashion, ha ha, so to avoid sharing too much of other people's saliva we were advised to go early. Being the kiasu Singaporean that we are, we made sure we were the first at our table by getting there just before 6 pm. There isn't much variety, just the basics like pork, shrimps, liver, braised pig ears, see-hum, quail eggs, assorted fish paste balls and such, yau-char kwai, kangkung, bean-skin cakes etc. , but all were chosen for their propensity to soak up the terrific sauce. The sauce was well blended, not too spicy or hot, but with more oomph than ordinary satay gravy. The eating here is not expensive. 40 cents per stick, 50 cents for the 'premium' stuff like liver and pork. We were not too hungry otherwise I would have eaten more. Four of us managed only 34 sticks. The sky was still light when we waddled out with our full bellies. So we jalan-jalan-ed around town. The pasar malam at Jonker Walk was very diverting. Karaoke competitions, restored pre-war buildings, tourists mingling happily with locals, the wares being sold neither too kitschy nor bland. The Jonker Dessert place served lacklustre versions of cendol and laksa, but the house itself is worth a look at for its period architectural details, crammed as it is with loads of beautiful old things. And after Jonker Walk, there was more shopping at Tesco. Finally, at 10.30 we headed back to Singapore. In the car, I thought of the celup again. Next time we will definitely stop over.